We won’t be mentioning km in tonight’s report. What we will focus on is the fact that the heavily crevassed and complex Scott Glacier is finally behind us. Grizzly peak is still visible in the distance but we are back at the toe of the Robison Glacier and far kinder terrain lies ahead, for a while. Today was another battle against the wind and ice. Jean did a great job of navigating our way out of the hazardous Labyrinth. We must’ve covered at least 50% more kms than our straight line distance over the last four days due to the constantly changing, complex and heavily crevassed Scott Glacier. But hopefully it will still be quicker and certainly more fun than the torturous pace of man-hauling. If it doesn’t work we’ll revert back to walking which should be far less work over gentler terrain. We have enough time and supplies to get to our Depots one way or another. If kiting works well we could be doubling our distances or more. We live in hope. After the Robison we will continue East for 60km across the California Plateau via a different route to our approach. 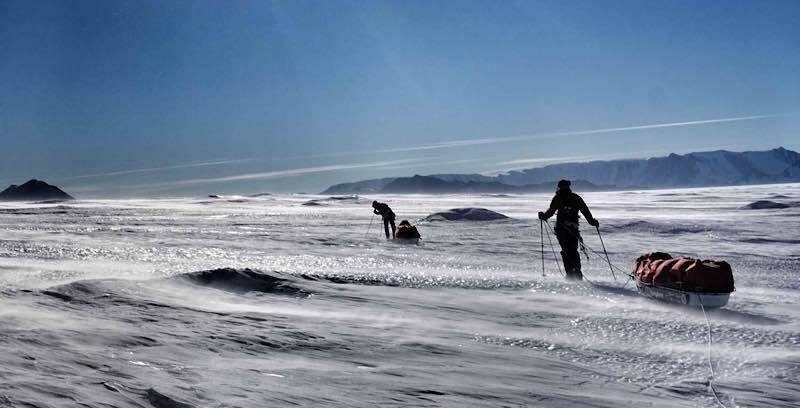 Again if the wind allows we are hoping to kite this across to the South Pole traverse road which we will then follow, most likely man-hauling 50km to our depot B and then 120km further to Depot A. 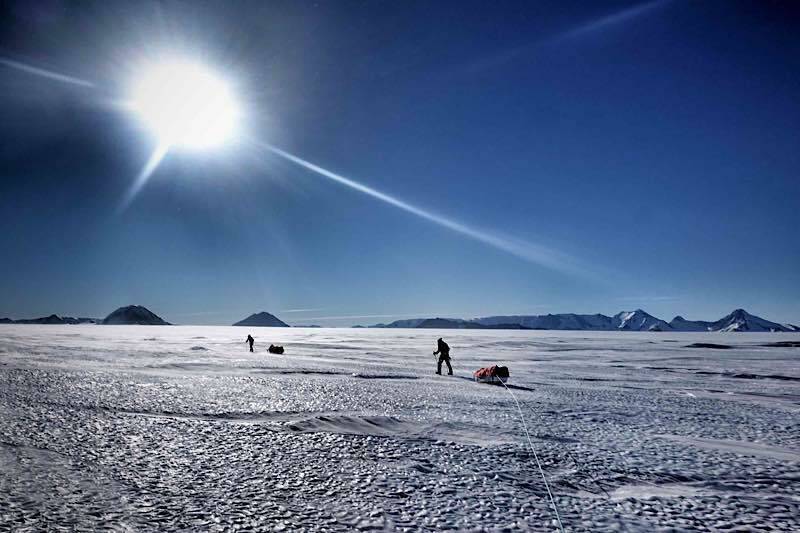 Then the 1100km downwind kite journey from Depot A back to Union Glacier; a kind of expedition in its own right. Our first goal is the top of the Robison, hopefully by technical kiting. Then we are praying for some California dreaming across the plateau. When we reach the ‘road’ we will probably have to get our march back on, but once again it’s all down to the wind. It dictates everything with wild extreme; from how well you sleep, to how cold/hot you are, whether you travel 0km or 200km, or are in heaven or hell. The wind decides and she’s a wild one! Je comprends mieux l’utilité du tractage de pneu 😉 Au moins, tu étais affûté Jean. En tout cas,bon courage, ca va finir par devenir favorable pour le kite. Greetings from Brazil! I just found you guys while reading of my daily FT news! As a sailor, the idea of you guys using the wind to travel on that far “planet” seems incredibly smart and fun, but I am sure it’s a journey for heroes, so congratulations for the expedition, and we will be hoping for safe winds all the path!